That's real creepy. It kind of reminds me of the Twilight zone where such things could be experienced. I wouldn't whant it to happen on my expectant wife though! This is the kind of stories that keep me up at night, but somehow, I still keep on reading. Creepy... This story sort of reminds me of "The Stepford Wives." This story creeps me out because the realistic baby sort of trains parents to be unfit, especially if these women are expecting to be new mothers. How strange is this story? I do find it strange how these women are not capable of distinguishing a live baby from a baby doll. That definitely sounds like something from Creepypasta.com. If you've never been there, then I definitely think that you are in for something crazy. Creepypasta is actually my go-to place for horror stories. He and his girlfriend weren’t the most romantic couple – their idea of spicing up their relationship was making out in the dark. He came over to her house late one night, when her parents were out of town, and they lay down on her bed together. He turned off the bedside lamp, held her hands in his, and began kissing her gently. The thing about the darkness is that it heightens your other senses. The sound of her gentle breathing, beginning to quicken. The sweet smell of perfume at the base of her neck. The taste of her lips, and the salt on her skin. The feel of nails beginning to dig into his shoulders. Despite the darkness, his eyes snapped open as he realised that both her hands were still clasped firmly within his own. These things don't creep me out. I'm much stronger than that. Scepticism is the way. Um, I really didn't want to read something as disturbing as that, especially on a sunny and wonderful morning. But those kinds of stories are awesome to read because it can be grounded in the real world. It's creepy and dark but nothing that can't happen in real life, especially if there are really unfit and mentally disturbed parents out there, which we hear about all the time and the victims are usually their kids and it breaks your heart to hear such news. Those kinds of stories may be a little far fetches, but it wouldn't surprise me. 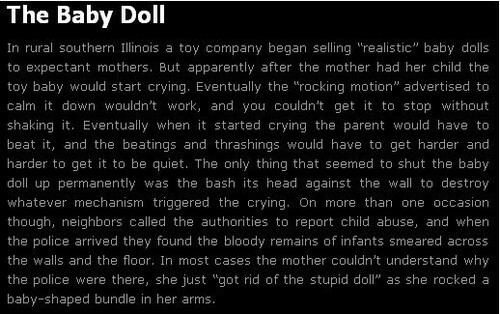 That's really creepy, I remember reading something like that on creepy pasta a year ago, only that it was a much longer story, but the same subject, someone mistook his child for a doll without realizing. Not really that scary to be honest, but I'm not a person who gets scared easily. I suggest you take a look on www.reddit.com/r/nosleep if you want more of this genre. All times are GMT. This page was generated at 19:34.